The interior of Sayville Bowl. Image courtesy of MapQuest. Year unknown. I went to a kid’s birthday party a few weeks ago. Normally, these are held at one of those huge playland places that have ball pits, inflatables, kiddie habitrails, and that have names like Bounce and Play or Adventure Central. This party, however, was at the local bowling alley, and as I watched my son bowl (well, more like drop the ball in the lane and rush back to the chair so he could see the computer animation), I couldn’t help but think of the number of bowling birthday parties I attended as a kid. My birthday parties–and most of my friends’ birthday parties–were pretty standard back in the 1980s. We’d go to the birthday kid’s house, play a few games, eat pizza or hamburgers and hot dogs, drink way too much soda, and finish off with Carvel cake. Then everyone would go home with goody bags that matched the decorations–cups, plates, paper tablecloths, etc–for Star Wars, He-Man, or whatever the party’s theme was. Sometimes, the party would be a sleepover and we would put the parents through hell because hours of fun and hours of soda and candy equals no actual sleeping at the sleepover. The parties were straightforward and always fun. But bowling parties were a reality and we considered them some of the most memorable at the time, even if they don’t measure up to the standards of today’s epic theme parties and play apparatus. Bowling at a birthday party in the early 1980s was some of the most fun you could have as a kid for a few hours, and Sayville Bowl was the typical AMF bowling center whose decor would remain so unchanged for years that when I was in high school and college it seemed like 1979-1983 were being preserved for posterity. I don’t remember being a particularly good bowler–it was a lot of gutterballs and not enough Superman III–but I remember having an enormous amount of fun anyway. Sigh … it’s never Superman III. … we usually headed out for whatever food was being served at the party. The bowling alley did have a party room and I went to a few birthday parties there, as well as a few parties at the pizza place in the adjacent shopping center on Raft Avenue (I’m pretty sure it was called Vinny’s), but the really awesome bowling parties were at The Ground Round. 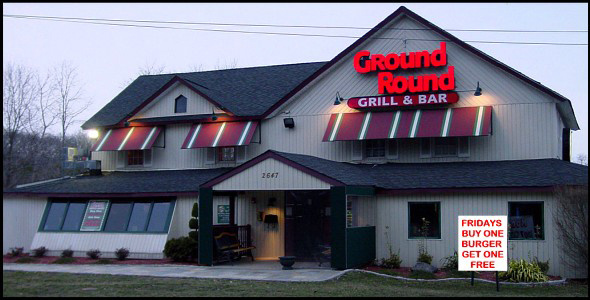 An early one of the chain restaurants that began dominating suburban shopping centers in the 1990s, the Ground Round was founded by 1969 by Howard Johnson’s. The appeal of the restaurant, at least to kids, was the endless popcorn and peanuts you could much on without having to care about cleanliness because you could leave your peanut shells on the floor. Plus, there were cartoons and Bingo the Clown–and I should note that this was back in the days before Poltergeist and It seeped their way into my consciousness, so I didn’t realize how scary clowns actually were. The Sayville Ground Round, which was in the parking lot of Sayville Bowl, showed those cartoons and old episodes of The Little Rascals on a huge screen in the back of the restaurant where they had sectioned off a few tables specifically for kids’ birthday parties. Apparently, this was the type of thing that drove the restaurant staff crazy because, well, if you’ve ever had to deal with a small area full of screaming kids, you’d go crazy too (my heart goes out to those working at Chuck E. Cheese). The inside of the restaurant was pretty dark, as was pretty much every place you ventured into back in the early 1980s, a decor that I’m sure came about because dark wood and low lighting covered up the damage that years of cigarette smoke can cause. We were ushered past most of the family dining area and to the kids’ party section, which was right in front of the big screen (which when not running cartoons was running toy commercials); Bingo the Clown was an often reluctant employee (as evidenced by this hilarious blog post) who made enough of an appearance to do his or her job but not too long lest your cartoon watching be interrupted; and we were all served burgers, pizza, or whatever kid food happened to be on the menu back in those days before we were returned to our parents, who were probably grateful for having a couple of hours off on a Saturday afternoon. We left the party with whatever goodie bag our friends’ parents had chosen as well as a balloon. When I was about six years old, I wound up learning an early physics lesson when I accidentally let go of my balloon when I was getting into my parents’ car. Not knowing that it was filled with helium, which is lighter than air, I cried as it floated up and out over Sunrise Highway. I don’t recall what my parents did to calm me down beyond explaining the physics of why the balloon floated away instead of remaining suspended in the air right above the car door. I know that I didn’t get another balloon and swore to myself with the utmost intensity that I would not let my balloon go ever again. The only remaining Ground Round restaurant on Long Island, which is located on Montauk Highway in Brookhaven. The next year, I deliberately let the balloon go because it was awesome to see how far it flew. How soon you forget such promises when you’re a little kid. The Ground Round hung on at least until the mid-1990s or so and in recent years, its parent company has filed for bankruptcy and the restaurant’s focus has been more like a Ruby Tuesday or T.G.I. Friday with upscale casual dining that’s family friendly but doesn’t have the kids zone/peanut shells on the floor/popcorn with dinner things that it used to be known for. As with so many things from my childhood, the Ground Round at which I used to attend birthday parties is no more, having become Ruby Tuesday a number of years ago and the only remaining Long Island location is at the corner of Montauk Highway and Horseblock Road in Brookhaven. But as much as things fade and are replaced by other things newer and better, having our own birthday place was special, at least for a little while.